The excitement in certain parts of the city was unfathomable. Participants filtered in from the neighborhood and waited with their cheering parents and friends for their matches in respective categories. People watched from their balconies. The mercury in the outdoor thermometers hovered around 41 degrees Celsius (105.8 Fahrenheit). It was raised a few levels by the haughty theme song a Kolkata police music band composed solely for the competition: We won’t leave without a fight, our targets have been perfected; this is not just a game, it’s time for change. Onlookers swayed and clapped rhythmically ignoring the heat. There’s a sad reason why this championship is happening over this blistering summer month. “Apart from cricket and football, all other sports are considered second, third, and fourth grades in this country. Neither the government’s sports departments nor the general public acknowledge their presence or need,” said a bitter Saswatha Mukherjee, a banker whose daughter participated in the competition. The championship was postponed twice from the original dates in January for want of sponsorships and financial support. Although women’s sports personalities fetched the two medals India brought home in the 2016 Olympics and, in the past few years, women have appeared and excelled in almost every sports being played in the country, fan loyalty and media support still are faraway dreams for them. That affects sponsorship and funding decisions in women’s sports and championships of almost every kind. “Morally, the sports department and several entities promised help,” said Montu Das, founder-secretary of the Kickboxing Association of West Bengal and the brains behind the event. “But at the time of need, nobody came forward. “We used municipality parks for eight out of the nine venues, and wanted to distribute customized competition-themed T-shirts for every participant but that wasn’t possible for paucity of funds,” said Das, who also is a former professional kickboxer. “We sailed on as soon as we found a sponsor taking care of refreshments and a few other basic requirements.” Eventually, the Department of Women and Child Development of the State Government and the real-estate business Merlin Group came to support the event. Despite these challenges, Das pushed ahead. As passionate as anyone about kickboxing, he wants to bring this sport to more children, especially young girls. Like with other sports, he hopes they’ll gain both physical power and mental confidence from it. A good number of the competition’s participants are his students, he said, and come from poverty-ridden households. On the seventh day of the competition, as the next match between two other participants started, the audience cheered. A few even shouted out advice. “Guard yourself and hit. Guard your torso and hit,” yelled Sushmita Panja as Pushpa Jha, her friend, fought for a point. “She’s underweight for her age and younger than her participants but she’s good,” Sushmita pointed out, and the coach agreed. Back at the competition, another match concluded and the referee raised the winner’s hand. The volunteers took their notes. The top three scorers for each category in each venue fought it out days later to decide the winners and runners up for that category. The winners received a cash prize of Rs 10,000 (approximately $156) while the runners ups received Rs 5,000 (approximately $78). 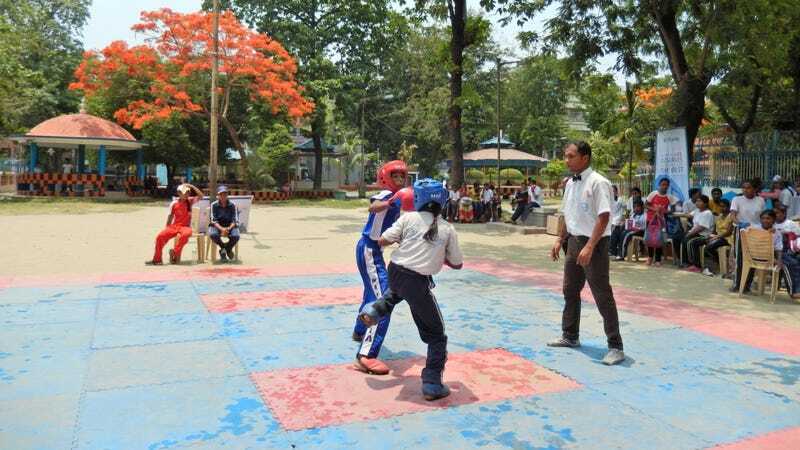 Ankita Dutta stood second on the seventh day of the competition, and came away ready to dedicate herself to kickboxing. Sonia Das lost the match but the jury sitting on one side of the park and watching every move with eagle-eyes agreed that this girl has power. She’ll need to be pushed forward with training and guidance. This is how Das and his instructors find talent and offer opportunities to hone them. Candidates selected this way often end up being trained up by Das himself, completely free of cost, once a week, at Das’s kickboxing institute in the southern part of Kolkata. Maybe one day, under the aegis of Das, Sonia would end up playing for the country in the internationals.